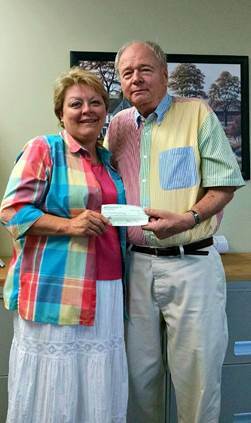 Prince Frederick, MD – The wind may have been minimal but the giving was bountiful as Calvert Hospice recently received a $1200 check as a result of the 2014 Sail 4 Youth charity regatta. Founded by Stovy Brown in 2006, the Sail 4 Youth regatta donates funding to three local organizations: Calvert Hospice, the Southern Maryland Sailing Foundation and the Rotary Club of Prince Frederick. For more information on Calvert Hospice or its bereavement programs, please visit calverthospice.org or call 410.535.0892.